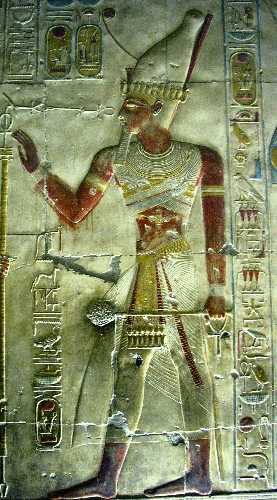 Seti I had held the same titles of Vizier and Troop Commander as his father, Ramses I, whom he rapidly succeeded. In order to restore Egyptian fortunes after the instability under the Amarna kings, he inaugurated a policy of major building at home and a committed foreign policy abroad. He took the additional title of 'Repeater of Births', signifying the beginning of a new and legitimate era. It was indeed a period of rebirth for Egypt, and during Seti's 13-year reign Egyptian art and culture achieved a maturity and sophistication that were scarcely equalled in later centuries. Seti married within his own military 'caste', choosing Tuya, the daughter of a lieutenant of chariotry, Raia. Their first child was a boy, who died young, and their second a daughter, Tia. Their third, another boy, took his grandfather's name and later became Egypt's mightiest pharaoh, Ramses II. A second daughter, born much later, was called Henutmire and she was to become a minor queen of her elder brother in due course. Seti led a military expedition into Syria as early as the first year of his reign. The records of this campaign and several subsequent ones over at least the initial six years of Seti's rule are preserved on the outer north and east walls of the great temple of Amun at Karnak. They follow a basic pattern of the army on the march, where Seti followed his predecessor Tuthmosis Ill's tactic of swift movement up through the Gaza Strip and Palestinian coast, thereby securing his flank and supply lines by sea into Phoenician ports. Fortresses are shown being attacked and Syrians captured, bound and carried off, the whole culminating in a huge representation of prisoners being slain before Amun. Other campaigns were waged against the Libyans of the western desert, and there was a renewed attack upon Syria and Lebanon where, for the first time, Egyptian met Hittite in battle. One scene at Karnak shows the capture of Kadesh that was to be the focus of the famous battle in later years under Seti's son, Ramses II (p. 150). All the while Seti was endeavouring to restore the past glories of the earlier 18th Dynasty pharaohs Tuthmosis III and Amenhotep III.